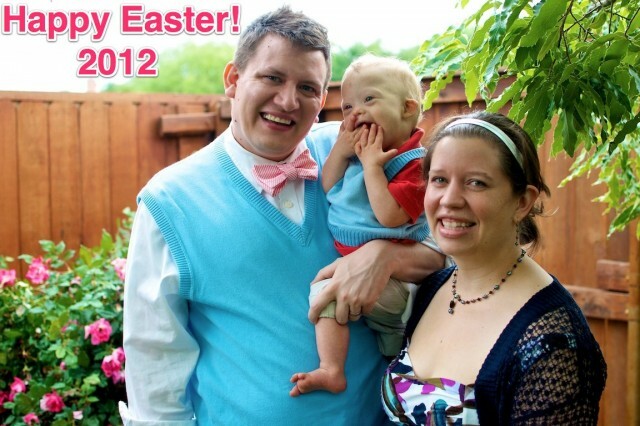 Happy Easter 2012 from Rick, Noah, and Abbie! We have so much to be thankful for this year. How did you and your family spend Easter 2012? Happy Easter everybody. We too celebrated the Resurrection of our Lord, Jesus Christ. We spent the morning at church. Timothy had to acolyte at early church so his daddy took him. He then went to Adult Bible Class (no more Sunday School for him). Then he came to late church with my mother and me. He just loves church. He will go as many times as he can. After church, my dear hubby took us all out for lunch so “mommy won’t get so tired of cooking”. He asks me that several times a week. I think he is just hinting to go out to eat. He thinks if mommy is tired of cooking that daddy will automatically go out to eat. Then we spent a restful afternoon doing what each of us wanted to do. We failed to take pictures today. Timothy wanted a new suit for Easter this year. I’m still waiting for someone to shorten the pants for us. Hope you all had a great day. You rock that bow-tie Rick. I think they are coming back into style these days. I rocked one as well this year (first time ever). Pictures on FB. Noah, you look cute as usual, and Abbie, your dress is nice as well. Awesome family! I pray that God will keep using your story and Noah’s syndrome to encourage people for years to come. What an absolutely lovely family you have. Enjoy that sweet baby, he is just so precious. My parents got to come visit, we had a great worship service this morning, and the boys sported their first-ever ties. They were the handsomest boys in town, for sure. 🙂 We weren’t that competitive in the egg hunts, so the little candy we got is almost all eaten! Score in my book! James tried a cookie (still working on eating solids). I’m not sure if he was a fan. It’s funny how the junk we eat is more of an acquired taste! Yesterday we Spent the morning at church, Then Headed back to my parents, where the kids did a big egg hunt and had a BBQ for lunch. Then we went to Matts parents for another hunt and some yummy hot cross buns! Happy belated Easter to the Smiths! Love the pic! These other Smith’s celebrated the day reading Scriptures together, watching an old church conference online and snuggling with our 14 week old. Sabra was born with a compromised immune system, due to my issoimmune pregnancy. And recently we found out her PDA is massive, causing her to easily develop upper respiratory infections. So we’re avoiding the public right now; including church. Next year will have to suffice as her first time REALLY celebrating Easter! We went to the church service at the Rochester Blue Cross Arena (NY)…50,000 people were in attendance. That’s a lot of holy spirit together in praise! It was the most awesome display of love I’ve ever taken part in. Jesus Christ is Risen! God is Good! Blessings to everyone who is blessed with a child, no matter the challenges that may bring, every child is worthy of love, every child is a gift from God!